Unroofed coronary sinus, an unusual form of interatrial communication, is a rare congenital cardiac anomaly. It is not considered a true defect of the atrial septum and is characterized by interatrial shunting across the ostium of the coronary sinus.,, It is in the majority of cases, associated with a persistent left superior vena cava, and is often a part of a more complex cardiac malformation.,, An isolated coronary sinus to left atrial fenestration is extremely unusual.,,, It often poses diagnostic difficulties.,, We report a case of this unusual form of interatrial communication in a 7-year-old girl child who presented to us with breathlessness on exertion. A 7-year-old girl presented with a history of breathlessness on exertion and mild exercise intolerance over a period of 2 years. On clinical examination, she was normotensive with normal heart rate. She had a hyperdynamic right ventricular impulse, normal heart sounds, and a soft ejection systolic murmur over the pulmonary area. Echocardiography (ECG) showed sinus rhythm with right axis deviation. Chest radiograph showed a prominent right descending pulmonary artery. Laboratory data were normal. Preoperative ECG evidenced a coronary sinus type of interatrial communication measuring 10 mm × 16 mm with left to right shunting [Figure 1]. The subcostal view was most useful in defining the interatrial shunting characteristic of this defect. The right-sided heart chambers and the pulmonary artery were marginally dilated. The absence of a left superior vena cava was documented. Intraoperatively, we encountered a pure coronary sinus type of interatrial communication measuring 1.5 cm in size and a normal coronary sinus ostium [Figure 2]. She underwent successful pericardial patch closure of the defect. To avoid atrioventricular block, sutures were placed close to the rims of the defect. The postoperative course was uneventful, and at 1-month follow-up, the patient remained asymptomatic. Unroofed coronary sinus, an unusual form of interatrial communication, is a rare cardiac anomaly accounting for <1% of lesions associated with interatrial shunting. It is not a true defect of the atrial septum and is an uncommon variety of interatrial communication through the mouth of the coronary sinus.,, Such defects are often difficult to diagnose and may even be overlooked during surgery for complex congenital heart disease.,,, In this defect, the coronary sinus forms initially within the left atrioventricular groove. 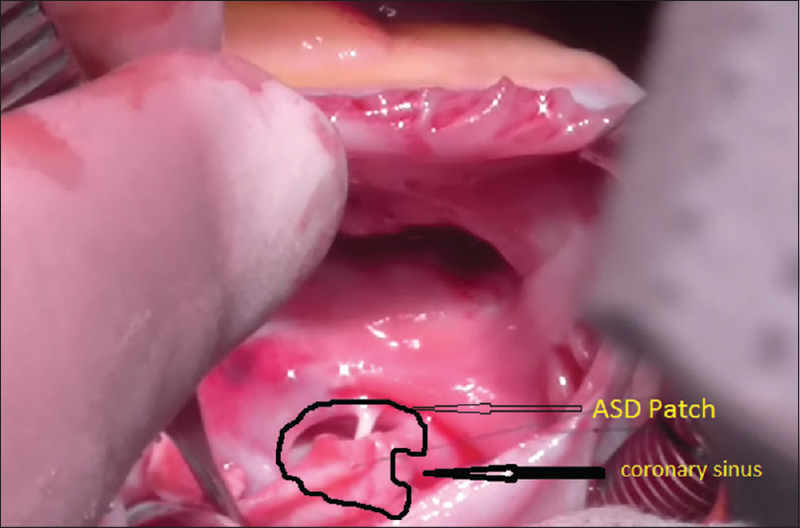 Depending on the extent of dissolution of its wall adjacent to the left atrium, along with the corresponding left atrial wall, a communication between the atriums through the persisting mouth of the sinus is produced. Shunting of blood occurs through the defect in the roof of the coronary sinus from the left atrial side to the right atrium through the coronary sinus ostium. It is in the majority of cases, associated with a persistent left superior vena cava and is often a part of a more complex cardiac malformation.,, Several anatomic variations of this defect have been described, including partial fenestrations between the walls of the coronary sinus and left atrium to a “pure form” of this defect. An isolated coronary sinus-left atrial fenestration is extremely unusual.,, Furthermore, the surgical treatment of such an isolated defect is complicated by its proximity to the atrioventricular node. We report an uncommon presentation of an unroofed coronary sinus without the association of a persistent left superior vena cava. In this case, the defect was diagnosed preoperatively using transthoracic two-dimensional ECG followed by successful patch closure. Knauth A, McCarthy KP, Webb S, Ho SY, Allwork SP, Cook AC, et al. Interatrial communication through the mouth of the coronary sinus. Cardiol Young 2002;12:364-72. Bertram H, Paul T, Kaulitz R, Luhmer I, Kallfelz HC. Coronary sinus defects: Rare form of interatrial communication. Z Kardiol 1996;85:899-905. Chaturvedi A, Dubinsky TJ, Maki JH. MR findings of a rare defect, coronary sinus ASD. Int J Cardiovasc Imaging 2012;28:429-30. Gajjar TP, Rao JN, Desai NB. Echocardiographic diagnosis and surgical closure of coronary sinus type of atrial septal defect. J Card Surg 2011;26:653-6. Takahashi H, Sakamoto T, Amano K, Hada Y, Serizawa T, Tomaru T, et al. 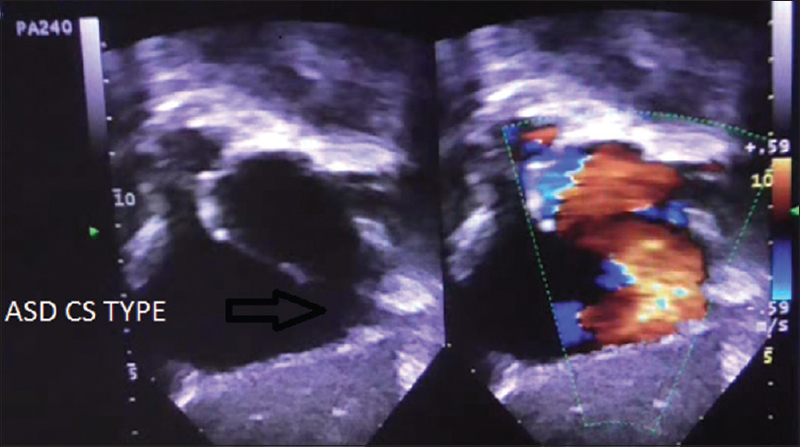 Coronary sinus type atrial septal defect diagnosed by two-dimensional color Doppler echocardiography: A case report. J Cardiogr 1985;15:1283-91. Shimura H, Uemura S, Harada Y, Kasegawa H, Murakami S. A surgical case of coronary sinus ASD. Kyobu Geka 1992;45:1097-8. Quaegebeur J, Kirklin JW, Pacifico AD, Bargeron LM Jr. Surgical experience with unroofed coronary sinus. Ann Thorac Surg 1979;27:418-25.